Effectively using both known and anonymous data gives marketers an edge to guide customer desires and build loyalty. Learn more in a free webinar March 9. True personalization is a tall order, especially when you consider the fact that brands’ audiences largely consist of anonymous users. Data, when used correctly, can provide invaluable insights that can maximize investments—making it an important part in any marketing event strategy. 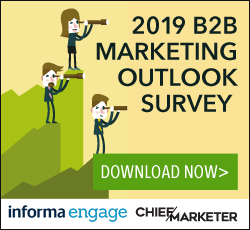 Huge volumes of marketing data enable companies to connect with customers in ways only imagined 20 years ago. Tech investments reflect this excitement—sometimes too much. Social business is happening in real time 24/7, affecting all business functions, and exciting opportunities abound for teams that are ready to embrace social analytics. Natural skincare company 100% Pure is leveraging predictive marketing technology to run email campaigns, VIP offers and even using the data to help find the best locations for brick-and-mortar stores.